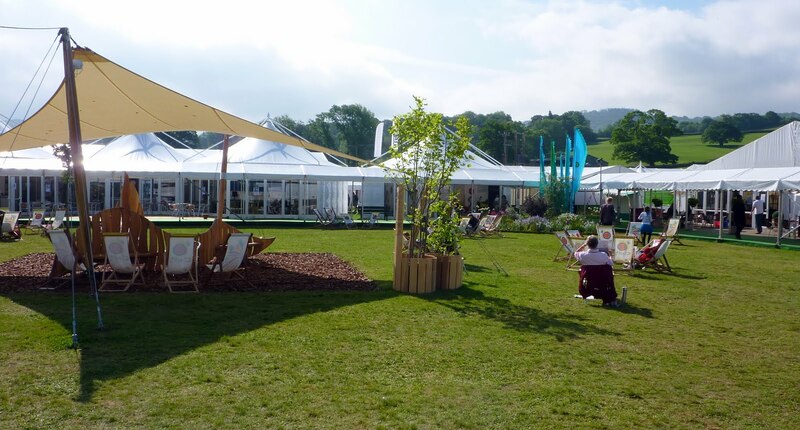 If you’re not familiar with the Hay Festival it’s a festival in Wales, lasting about ten days, where authors, publishers, journalists, celebrities, and suchlike give talks discussing their latest work. That is not to say they just sit there for an hour and shout ‘Buy my book! It’s awesome!’. Some do discuss the process of writing, particularly if it’s a translation piece, but most instead talk about the subject their latest book is on. For example, Roger Crowley gave a very interesting talk on the history of Venice’s naval empire. There are also panel discussions on a variety of things (such as themes in literature, the prospects of UK youth, and the designing of book covers), interviews with famous faces (Stephen Fry talked about mental health, Richard Holloway about his religious journey), performances by comedians (I saw the brilliant Tim Minchin and the hilarious Dylan Moran), and musical performances (which I’ll talk about in another post). The festival is currently sponsored by the Telegraph, which tells you a lot about about the demographic that attended. At one point I found myself queueing for a talk by Simon Armitage on his new translation of The Death of King Arthur (which sounds great, by the way), and had to spend twenty minutes standing in the freezing rain, listening to two strangers in long waxed coats* talking about the perils of yachting round ‘the Med’. Last time I went in 2010 it was sponsored by The Guardian and there was, much to my surprise, a subtle but noticeable difference in the people attending. There was less tweed, for starters. I’m not joking. Another major difference to last time was the weather. I can’t escape talking about it here, as it dominated my experience of the event. I opted to camp for the eight nights I was there, which in and of itself wasn’t a problem. What was a problem was the haphazard and optimistic packing that I did at 3am the morning I went. For example, I decided to take only one pair of proper shoes (suede) and flip-flops, one pair of trousers (jeans), and not to bother with a waterproof jacket at all. I am embarrassed by my own idiocy, and can only blame fatigue. Here are two comparative pictures. 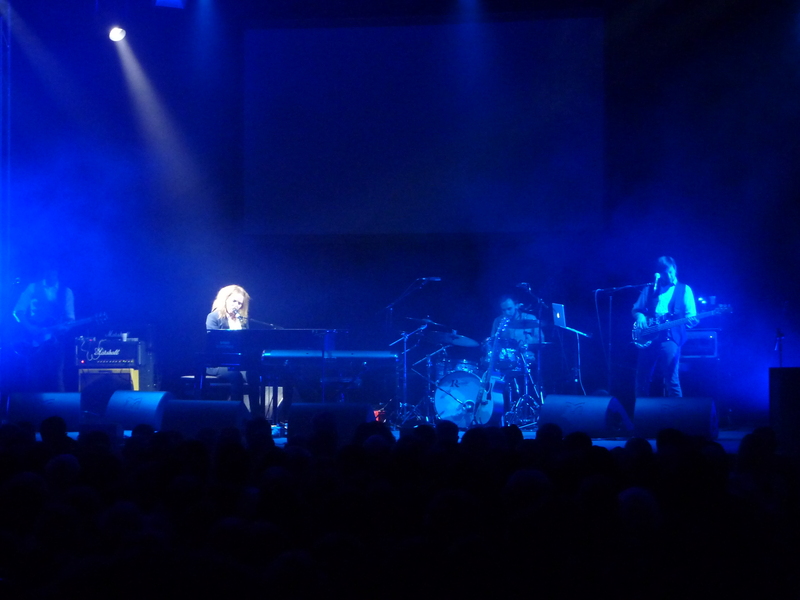 The first is the festival in 2010. The second is the festival on day four this year. After a couple of days of torrential, constant, freezing rain, any ground not covered by a walkway was a mud bath. Chaos ensued. Car parks were closed as they began to resemble ploughed fields, so people parked on the roads, so the police towed them away. All events began fifteen minutes late to compensate for the car-park issues. The two covered cafes were at full capacity, strangers sharing tables and elbowing each other aside to claim vacated seats. This I view as bad planning on the part of the organisers, who had clearly hoped that everyone would just be able to sit out in the sun and not set aside much space for covered seating. I had hoped to do lots of writing in-between talks, but there was often nowhere at all to sit, so I managed only half of what I would have done otherwise. I hope the organisers will consider adding ‘writing space’ apart from the cafes next year, as there were quite a few of us. I also ended up wearing shorts and flip-flops most days, despite the weather, as it was easier to dry off that way and my legs would go numb after a few minutes so I wasn’t cold any more. To add to colour to my soggy experience, I also managed to eat something that disagreed with me halfway through the week. The result was that I missed Warren Ellis talking about the internet and our brains (at HowTheLightGetsIn, an alternative festival in town) and Nick Harkaway talking about Angelmaker, as I spent one morning lying in my tent with a fever, slipping in and out of consciousness and being sick. That night I repaired to a B&B near Hereford at the insistence of my parents to dry out and recover. The B&B was notable for having horse skulls nailed to the underside of the floorboards downstairs back in the day, to improve the timbre of the floor when dancing. Nonetheless, it was generally very entertaining. 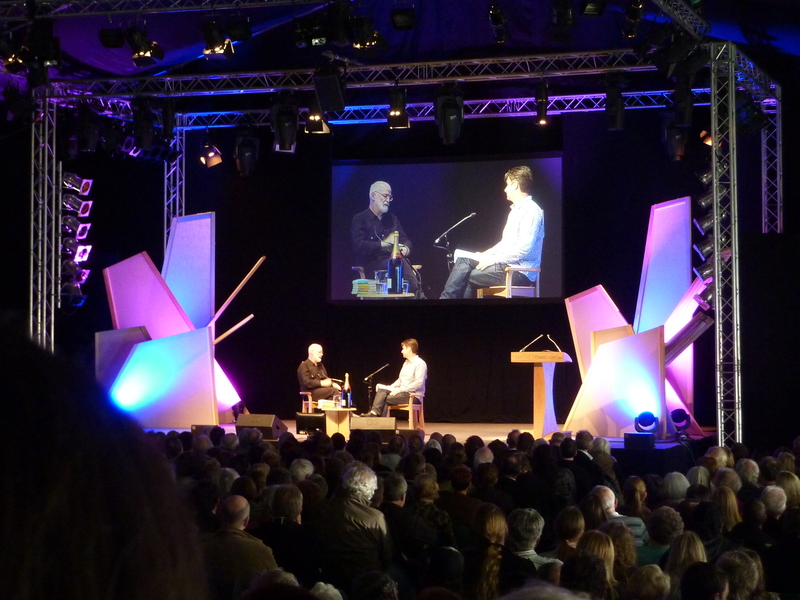 One of the stand-out experiences for me was seeing Terry Pratchett interviewed by his assistant Rob Wilkins. I’m a great fan of Pratchett’s work, and it was a pleasure to see him in person. Seeing him did raise another issue about the festival, though. Aside from Sir Pratchett, there was a distinct lack of science fiction and fantasy writers aimed at adults. Oh, there were plenty of fantastical things aimed at children, but the event I went to on heroines and dystopias in the lovely Starlight Stage was clearly not aimed at my age group, and I felt a bit out of place. I may be wrong, but I’m interpreting this as a bit of literary snobbery on the part of the festival. Perhaps they don’t think that the Telegraph-reading demographic care about SFF, and maybe they are right – but if that’s the case then they should be trying harder to get a greater variety of people to attend. I don’t think that there were many people there in their 20s at all who weren’t acting as stewards for unpaid ‘work experience’, and that’s a real shame. Anyway, I’ll round this off by saying that (despite the weather) it was a rather interesting week, and certainly not one of idleness. Between running around from talk to talk, absorbing information for 3-6 hours a day, and writing 5000 words of prose, it was actually quite tiring. I will likely go again in a year or two, but not if I want a relaxing holiday. And next time I’ll take my waterproofs. * I have nothing against waxed coats by the way – I think they’re great. – The Future of Publishing (According to Hay). 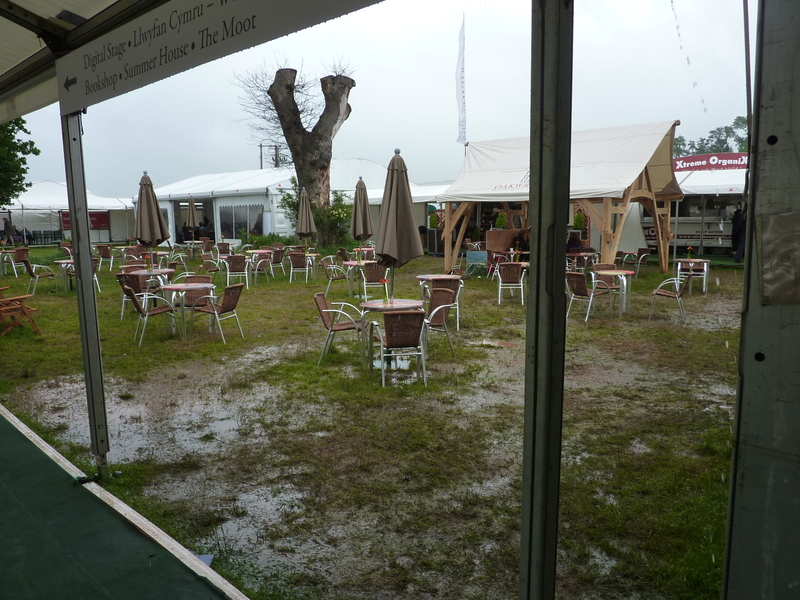 – A List of All Talks Attended at Hay, with brief thoughts. – Oo La Lume and The Devil’s Violin Company. I’m so jealous. Loved living vicariously through you.